Well, I’ve struggled like bilio to make use of this paper for smaller projects. Not because I don’t like it, but because some of the patterns are on the large size. I love the colours, and love the patterns, but as I said, it’s been a struggle. So, I have been determined to use this paper once a week in a bid to love it a little more. And I think I may have pitched this card just about right. 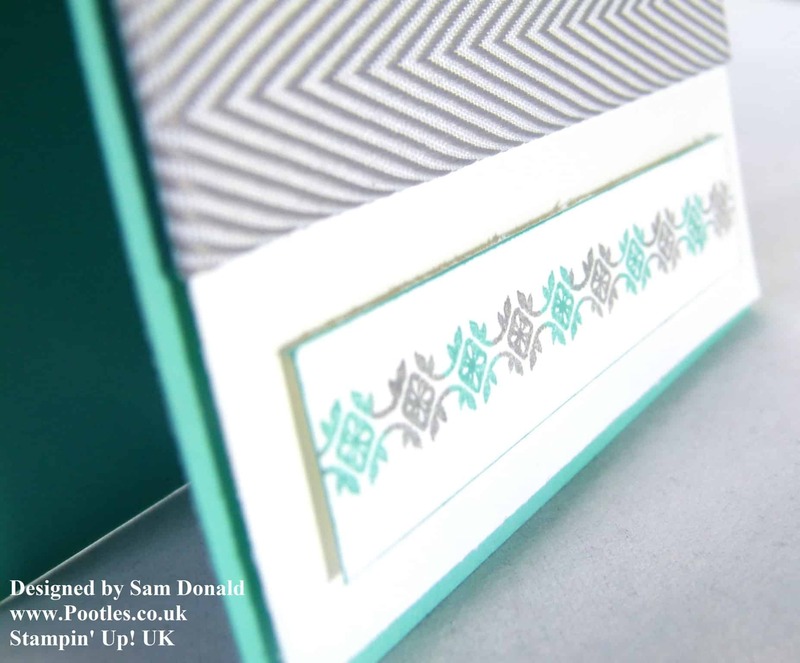 I simply made a Coastal Cabana Cardstock card blank, layered on a piece of the Eastern Elegance Paper with some Whisper White cardstock below it, wrapped the matching Smoky Slate Chevron Ribbon across the join to mask the middle. I decided to have a simple sentiment, so I took one from the Happy Day stamp set which is featured in the Eastern Elegance Suite section of the catalogue, stamping it with Coastal Cabana Ink, then I decided to pull out my markers, after this post was so popular and did a blended look across the Mosaic Madness stamp along the bottom. It’s clean and simple, but shows off the paper oh so well! Do you have a paper that you love but struggle to use?